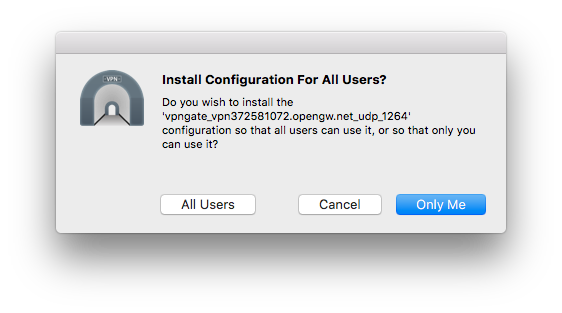 Installing Configurations - Tunnelblick | Free open source OpenVPN VPN client server software GUI for Mac OS X. 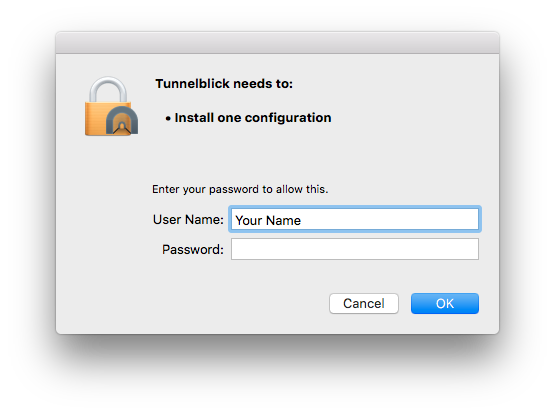 To connect to a VPN, Tunnelblick needs a "configuration" for the VPN. It contains all of the settings needed to connect to the VPN. The configuration could be a single file with a '.conf' or '.ovpn' extension or it could be a "Tunnelblick VPN Configuration", which is a file package with a '.tblk' extension. You can have as many configurations as you want. If you have a lot of configurations, see Managing a Large Number of Configurations for suggestions. Configurations are usually downloaded from your VPN service provider's website, or from your router or other VPN appliance setup page. Once you have downloaded one or more configurations, launch Tunnelblick if it is not already running, and then install a configuration by dragging it and dropping it on the Tunnelblick icon in the menu bar. If you have more than one configuration to install, you may select all of them and then drag-and-drop them on the icon to install them all at once. The name and password of a computer administrator is needed to install configurations because they can contain scripts which run with administrator (root) privileges to manipulate the computer's network configuration. When configurations are installed, they are secured so they cannot be modified without a computer administrator's approval. Enter your password and click "OK". (If you are not logged in as a computer administrator you will need to enter the name and password of a computer administrator.) A notification of the installation will appear in the notifications area. You may repeat these steps to install additional configurations at any time.